From there, Blood & Tacos will become CGP’s second imprint, and will be bringing you (by popular demand I might add) longer, stand-alone adventures from some of your favourite B&T characters. The website will still be bringing you free short fiction, but no longer in an issue-type format. We’re breaking out of the bonds of the rigid historical hierarchy, dammit! 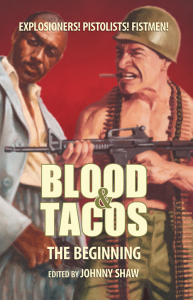 For more info on Blood & Tacos, like where to buy it for your kindle thingamagummer, buy a t-shirt, download the podcast, or just plain old read it online for free, you should really check out the website Blood & Tacos.